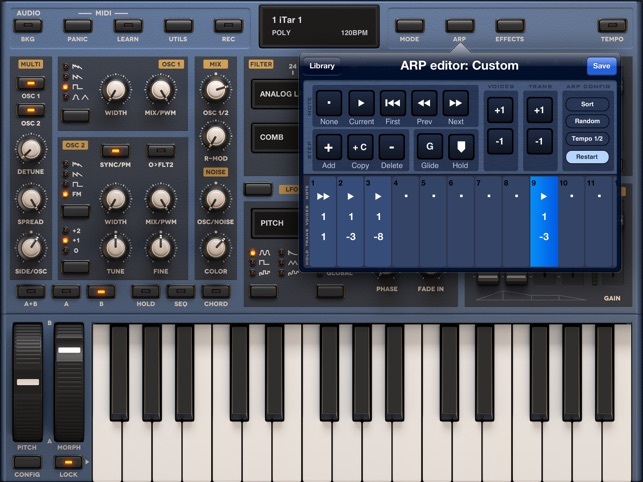 Sunrizer Synth is a virtual analog synthesizer that takes the definition of iOS synthesizer to the next level. 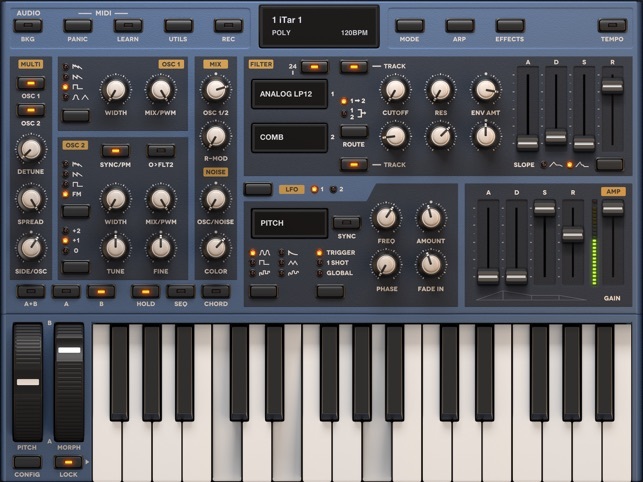 Sunrizer was built to perform and works perfectly with any MIDI keyboard or sequencer. A lot of research has been done in order to achieve unheard warmth and clarity. · True SuperSaw sound emulation, first found in the legendary Roland JP-8000 synthesizer. SuperSaw is a layered waveform consisting of multiple saw waves which are detuned to create an extremely full and epic sound. · Two filters per voice with configurable routing. 15 filter types available, including less common like Comb, Formant or Frequency shifter. 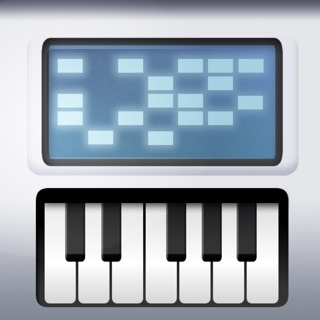 · Full support for CoreMidi, MIDI mapping, Virtual Midi Ports and background audio. 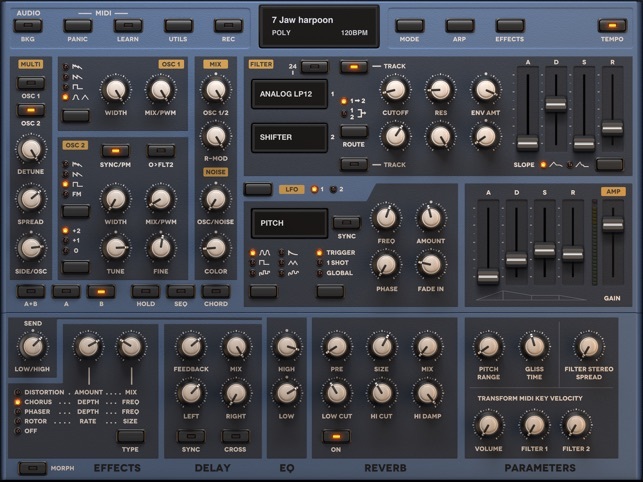 · Multi mode lets you multiply oscillators to get unbelievably fat and full sound. · Support for microtuning - load scl and tun files. Create fascinating microtonal music which uses intervals not found in the Western system of 12 equal intervals to the octave. · 2 warm-sounding analog modelled oscillators, 2 sub-oscillators (except SuperSaw). Available waveforms: Saw, PWM pulse,Triangle, SuperSaw, FM (frequency of phase modulation). 6 oscillators per voice in multi-sono mode. · Two independent filters per voice with configurable routing. Filter types: LPF, HPF, BPF, Analog LPF, Notch, Comb, All pass, Power LPF, Power BPF, Wave shaper, Resonator, Resampler, LPF+Resampler, Frequency shifter. · ADSR envelope, keyboard tracking and full LFO control. · Two LFOs per voice. It's possible to assign each LFO to almost any parameter. 3 LFO running modes: trigger, 1 shot, global. 6 waveforms, phase and fade-in knobs. · Two Modulation ADSR Envelopes for amplitude and filters cutoff. · Pitch and modulation wheels. · A number of effects are built in: distortion, hi-q reverb, chorus, rotary speaker simulation, equalizer, phaser and stereo delay. Dual-band FX processing. 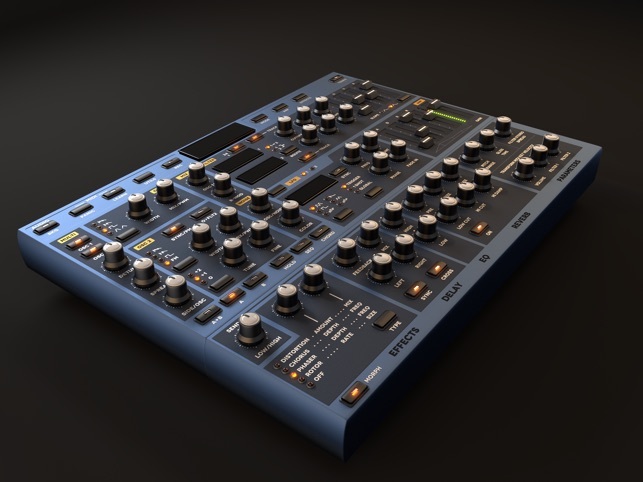 · Sunrizer incorporates very powerful programmable arpeggiator. You should think of it more like a small step sequencer. · Built-in recorder supporting AudioCopy, DropBox and iTunes file sharing. There’s still nothing else I’ve found quite like the JP8000 emulation on offer in Sunrizer. It’s so _good_ - fun to play with and invent and with so many free presets available from amazing artists, if you don’t want to explore the full depth of sound/patch design available in Sunrizer, it’s very easy to just pick up something that sounds _great_ and go play. Updating to AUv3 is a huge step forward for Sunrizer too - it’s so much better for the current state of the art in iOS music workflows than Inter-app Audio that there’s no comparison. I cannot wait to quit writing this text and get back to playing, so I will leave you with: If you like making music on your iOS device and you don’t already have Sunrizer, there is no reason not to drop some cash on it right now. Cheers! I am a professional keyboardist using multiple virtual Synths and sampler for my gigs. 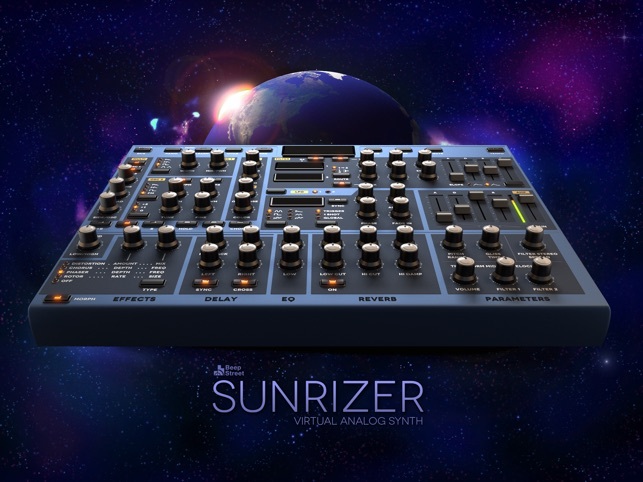 Sunrizer is my go to synth....and the one I keep finding myself using first before other synth apps. It creates atmospheric patches like no other. The only flaw I find and one that I hope can be amended is the lack of a compressor. Sunrizer is very sensitive to volume, and any sounds that go into the yellow zone on the amp begin to distort at levels where other iOS synths do not. A compressor would easily resolve this as it does in other high quality synth apps. Other than that, I love Sunrizer. Sunrizer has been an all time favorite of mine for it’s sound designing capabilities as well as it’s simple and beautiful one page GUI. I love the fact that the keys can be hidden when docking the effects section, so I have everything on one full screen while using a MIDI controller. I have often used Sunrizer in my hardware setup with my MPC. 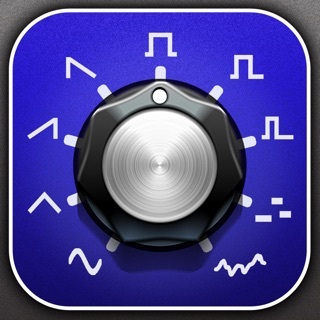 I never cared for AudioBus or IAA much, so I never used it much with other apps. But now with AUv3 added, I’m excited to be running a few instances of Sunrizer in Cubasis along with many other AUv3 instruments and effects.